We combined 3d with photography to achieve the desired result of 3 pieces of technology being blasted into oblivion by the miniature RAV4 car. We needed to freeze a moment of destruction in a way similar to high-speed photography of bullets hitting objects. In most cases (excluding couch), detailed 3d models were made of the objects and then shattered into thousands of pieces using physics based computer simulation. 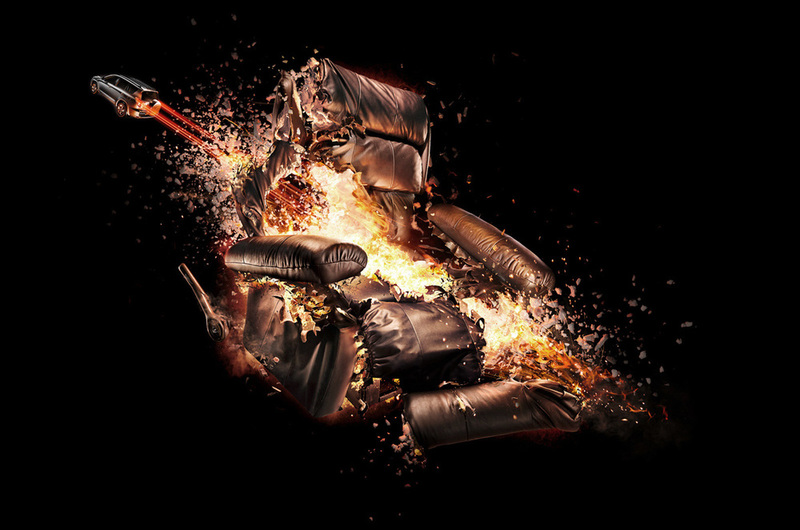 As well real things were smashed into thousands of pieces in the studio and shot with lighting to match 3d situations. The 3d pieces were then assembled with photo elements in retouching. All cars were rendered in 3d.